FOR THE PHYLLO LAYERS: adjust oven rack to lower middle position and heat oven to 425 degrees. Line rimmed baking sheet with parchment paper. Using pastry brush, lightly brush 14 by 9 inch rectangle in center of parchment with melted butter to cover area same size as phyllo. Lay 1 phyllo sheet on buttered parchment and brush thoroughly with melted butter. Repeat with 9 more phyllo sheets, brushing each with butter ( you should have total of 10 layers of phyllo). Spread spinach mixture evenly over phyllo, leaving ¼ inch border on all sides. Cover spinach with 6 more phyllo sheets, brushing each sheet with butter and sprinkling each sheet with about 2 tablespoons pecorino. Lay 2 more phyllo sheets on top, brushing each sheet with butter (these layers should not be sprinkled with pecorino). Working from center outward, use palms of your hands to compress layers and press out any air pockets. Using sharp knife, score pie through top 3 layers of phyllo into 24 equal pieces. Sprinkle with sesame seeds (if using). 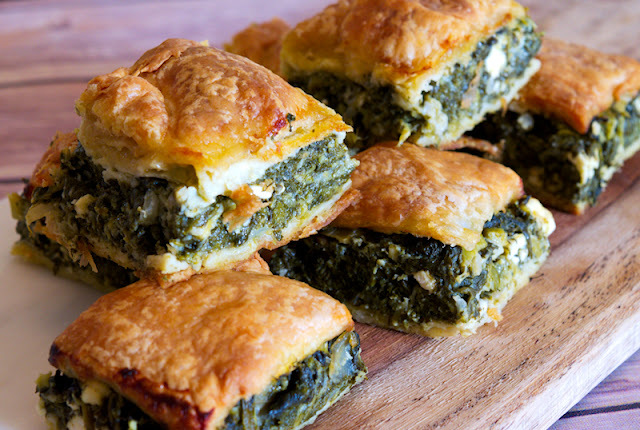 (spanakopita can be frozen whole on baking sheet, wrapped well in plastic wrap, or cut in half crosswise and frozen in smaller sections on plate. To finish, bake spanakopita frozen, increasing baking time by 5 to 10 minutes. Bake until phyllo is golden and crisp 20 to 25 minutes. Let cool on baking sheet for 10 minutes or up to 2 hours. Using parchment, slide spanakopita to cutting board. Cut into squares and serve. End.